Senior captain Madison Ryan (10) moves the puck into the attacking zone on a rush up the ice. 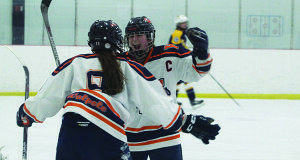 The Walpole High varsity girls hockey team welcomed in Notre Dame Academy (Hingham) on Monday night for a midseason non-conference clash between two teams bound for the state tournament. Thanks to a phenomenal seven-for-seven effort by the Walpole penalty kill unit and some stellar goaltending by senior goaltender Kiera McInerney (31 saves), the Lady-Rebels (7-2-0, 3-2-0) earned a 3-1 victory to hand NDA (7-1-0, 6-1-0) its first loss of the 2018-2019 season. At 6:25, junior forward Catie Martin tapped home a backhanded rebound following a shot from the slot by senior captain Audra Tosone, drawing first blood for Walpole. Senior goalie Kiera McInerney (pictured) hugs the post and keeps an eye on the puck down in the corner. NDA was awarded a power play with a little over three minutes to play in the period, but Walpole was able to kill off the penalty and then some. With 2:32 remaining, a strong fore-check by senior captain and forward Meghan Hamilton led to a turnover just inside the NDA blue line. Hamilton took the puck and fed it down low to sophomore forward Emily Desimone who broke in on a mini-breakway and fired a shot up high for a shorthanded tally to double the Walpole lead to 2-0. 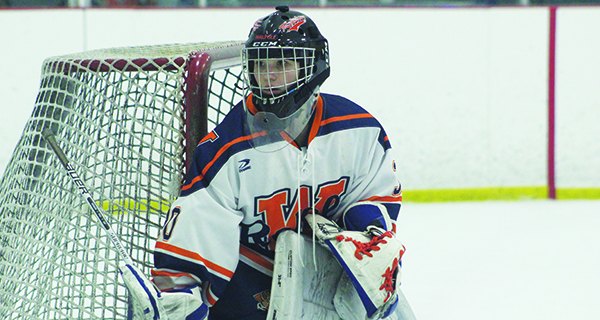 McInerney stole the show in the second period for Walpole, stonewalling a pair of grade-A scoring opportunities by NDA, including a sprawling left pad save on a breakaway bid with a little under six minutes to play in the frame. Walpole’s penalty kill unit thwarted a pair of NDA power play opportunities just before the end of the period, and the Lady-Rebs took their two-goal lead into the third. Emily Desimone (8) celebrates her would-be game winning shorthanded goal with teammate Meghan Hamilton (C) on Monday night. Notre Dame finally got one through McInerney to cut the deficit to 2-1 early in the third period. Walpole’s penalty kill did its job two more times throughout the third period to preserve the lead, followed by a game-sealing goal by freshman forward Livia Brooks to give Walpole the 3-1 victory. The Lady-Rebs will return to action on January 19 at Rodman Arena against Milton.